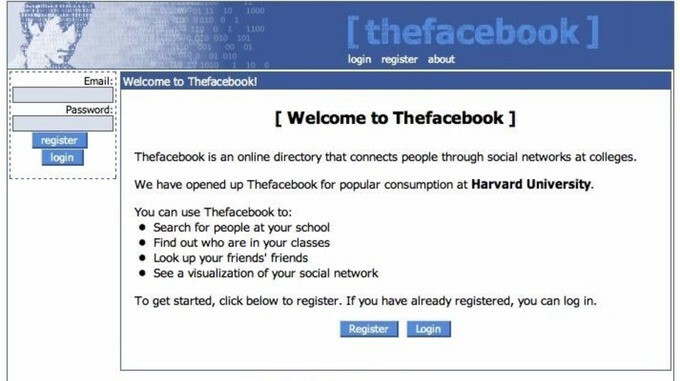 On the eve of Facebook’s 15th Anniversary, I paused long enough to remember how I got my start. 2006 was the first year I was a legitimate user, but way back in 2004, when I first read about this college campus experiment, I knew I had to be there. “For research purposes”, I reasoned. And so I cajoled my high school-aged son to aid and abet. After its elite beginnings at Harvard only, Facebook fanned out to other campuses in a systematic fashion that reads like a guide to best colleges. College email addresses were checked against roster registries so my initial Facebook visits were logged sitting next to my then college-aged kids. In 2005 when the service was opened to high school students my break-ins became easier. A high school .edu address and a single friend to verify did the trick. Yes, I coerced my son into vouching for my high school credentials. An no, we never discussed whether it was improper. Why is it that while I would never have lied on a job application, a medical form, or financial statement I felt no qualms about faking out Facebook? Why was it so satisfying? Computers and their services, I think, were pioneer territory and I was a cowboy in Dodge. The rules in the real world had no place in this mass experiment. I wore my Facebook entry like a badge of honor and actually began a series of talks at high schools explaining how Facebook worked (it was a lot simpler then) so parents and teachers could talk to their kids armed with the facts. With Facebook I fibbed to about my identity. Elsewhere online my actions were more like a thousand little deceits. Creating personas on the Internet became second nature. The ease of grabbing a new, free email address — Yahoo!, Hotmail, or some vanity.com address fueled the behavior. To this day the norm is to keep a few email addresses on hand. There’s the junk mail address, the shopping address and the people I like to hear from address. Lies? No, but the tone is set and the orchestra tuned for a world where no one is quite sure who they’re talking to. .
Computer advice columnists, of the day, dished out advice on how to protect yourself from shopping fraud by creating a fake account where you’d do all your online shopping. There were holidays when I’d actually keep lists of email addresses I’d used at different online stores. Revealing true identity was smacked of “newbie”. Does this get us to where we arefifteen years later? Not entirely. But, throwing advertising into the mix and being able to monetize individual IDs is built on a foundation where belief in truth is suspended. The incentives to create fake personae is enmeshed in the Internet’s DNA. The notion of multiple personalities and identities has been normalized. The early founders of the Internet were pretty idealistic about a world that would take online citizenship as a responsibility. Human nature has prevailed. End to end anonymity, one of the original tenets of the Internet is under scrutiny and a battle cry to clean up the mess is sounding, I’m betting that the next incarnation of the Internet will experiment with persistent IDs, blockchain techniques and more. But you know how the story ends. Technology may change. Human nature not so much. The incentives for telling the truth on the Internet are pretty negligible. Put the right incentives in for people to tell the truth and we may fare much better.